Because the more options, the better. When bread and cheese combine, it’s sure to be magical — no hyperbole intended. And adding in a little something extra can also up the flavour on such an indulgent sandwich. So to serve up some serious inspiration, the hosts of The Goods all shared their takes on this classic combo. 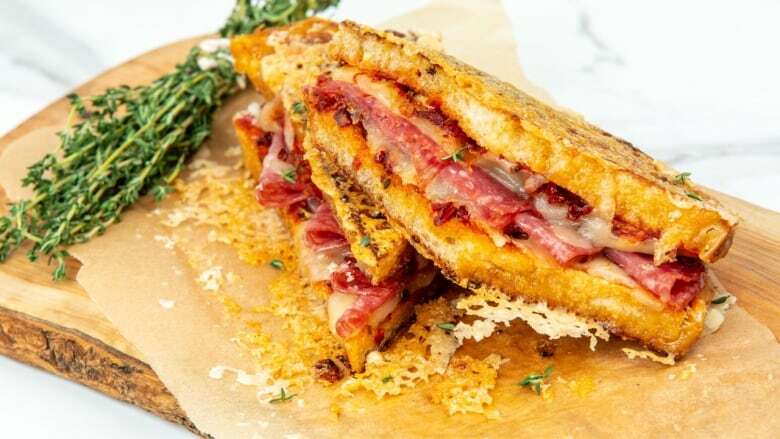 Here are four grilled cheeses perfect for mealtime, snack time, and any time at all. Heat a large non stick frying pan over medium heat and add 2 tbsp olive oil and 1 tbsp butter. Add your mushrooms and spinach to the hot pan, sauté until browned then remove to a plate, keeping pan around for use later. Generously butter one side of each slice of bread with remaining butter. Place butter side down on a large plate. 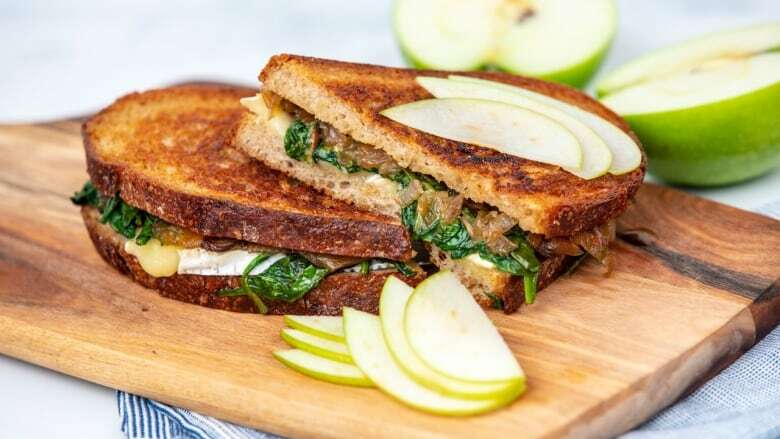 To the inside of each slice spread an even amount of caramelized onion jam., place brie slices on top, then sautéed mushrooms and spinach and finally add second piece of bread butter side up. Reheat frying pan used for sauteing to medium heat and add sandwich, cooking for about 3-5 minutes per side or until golden brown and cheese has melted. Serve apple on the side, enjoy! 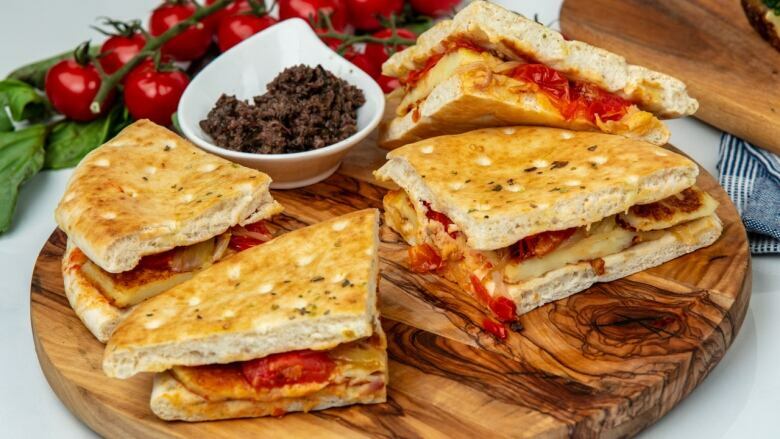 Place each slice of focaccia on your work surface. Spread equal amounts of pizza sauce onto each slice. To one slice, mash on roasted garlic, then mozzarella cheese, genoa salami, sprinkle on sun-dried tomato and top with second slice of bread, sauce side down. Heat a large non stick pan over medium heat. While heating, mix chili oil and mayonnaise together. Brush one side of sandwich with half of mixture and place mayo side down in your hot pan. Brush remaining mixture on the top of the second piece of bread while it cooks. Once browned, after 3-5 minutes, flip over to brown other side. To make crunchy parmesan crust, place parchment on bottom of pan, then sprinkle enough grated parmesan cheese to cover entire slice of bread. Place sandwich on top and slightly press down, checking regularly until a nice crust of lacey cheese has formed around the bread. 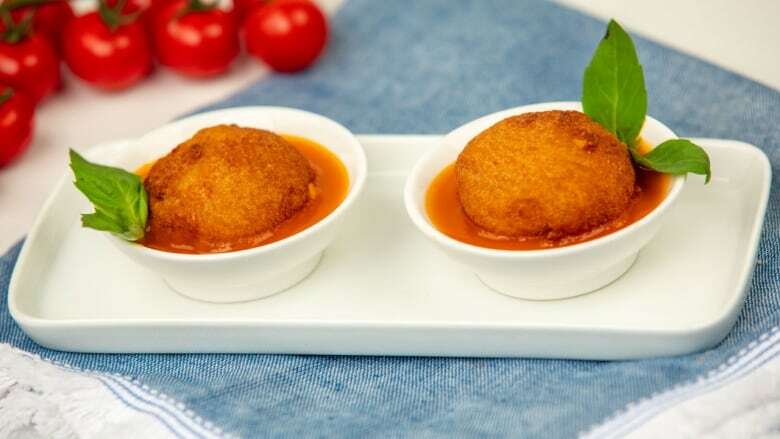 Freeze 2 tbsp condensed tomato soup into two, 1 tsp sized drops on baking tray lined with parchment paper. Reserve rest to make into tomato soup when serving. Place crustless bread slices on table and flatten slightly with rolling pin. Once tomato soup drops are frozen (roughly 1 hr), remove from tray and wrap cheese around each drop, into a ball. Brush outer border of flattened bread slice with a bit of the milk then place cheese/tomato soup drop in the middle of each bread slice and wrap around, squishing the bread until forms into a ball. Heat oil to 300F in a in a deep fryer or deep, heavy bottomed pot. Fry each cheese ball until golden brown on all sides, approximately 5 min. Remove with a spider and place fried balls on a paper towel lined tray to remove excess oil. In a small saucepan, heat remaining tomato soup to instructions on side of can. Pour a small amount of soup onto tasting spoons or shallow pinch bowls, place cheese ball on top. Eat! Makes 2 grilled cheese balls. Preheat oven to 375F. Add cherry tomatoes and shallots to a medium baking sheet. Toss with sliced shallots, 2 tbsp olive oil, dried oregano, salt and pepper to taste. Roast for 6-10 minutes until tomatoes are plump and ready to burst. While they roast, heat a non stick pan or grill pan over medium heat. Add 2 tbsp olive oil to pan along with sliced halloumi. Fry until you get crispy brown edges. Remove halloumi and keep pan for frying sandwich. To assemble, reheat your pan on medium and add 2 tbsp olive oil. Layer your sandwich in the pan as follows: pita, halloumi, roasted tomato mixture and second pita. Brush top pita with remaining olive oil. Then place a heavy cast iron skillet on top of sandwich to grill and press together for 1-2 minutes or until golden. Serve with tapenade on the side for dipping. Enjoy!